In a pan over medium heat, heat the oil, then add the onions, sambal oelek, garlic, cumin, caraway, coriander, and chili powder. Stir the onions and spices, until the onions are softened/translucent (approximately 5 minutes). Add the tomatoes and stir to combine. Allow the mix to simmer, stirring occasionally for 5 minutes. Remove the pan from the heat and cover. Allow the ingredients to rest, covered, for 10 to 15 minutes. Uncover and pour the mix into a blender or large bowl (if using a hand held food processor). Blend/process the mix until smooth. Add lemon juice, salt, and pepper to taste. 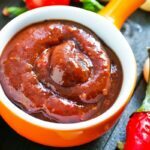 Serve immediately, or for best flavor allow the harissa tomato sauce to chill in the refrigerator for 1 to 2 hours to allow the flavors to meld.